Meghalaya, the name itself brings forth picture postcard images of lush mountain valleys, gushing rivers, roaring waterfalls, mountains clad in clouds, rock pools and mists surrounding its beautiful hills all the time. Along with my sister, I had traveled to Meghalaya in 2017 and I intend to capture my experience in series of articles starting with the Root Bridges of Meghalaya. The articles in the series would not follow my order of travel to different places but would be trying to group it by themes. In the Khasi hills of Meghalaya grows a special kind of Indian rubber tree which also has one of the strongest roots that grow out of the trunk of the tree. These roots can root themselves onto land, riverbanks, boulders or buildings. The root has the capability to find a stable place to put itself and grow. 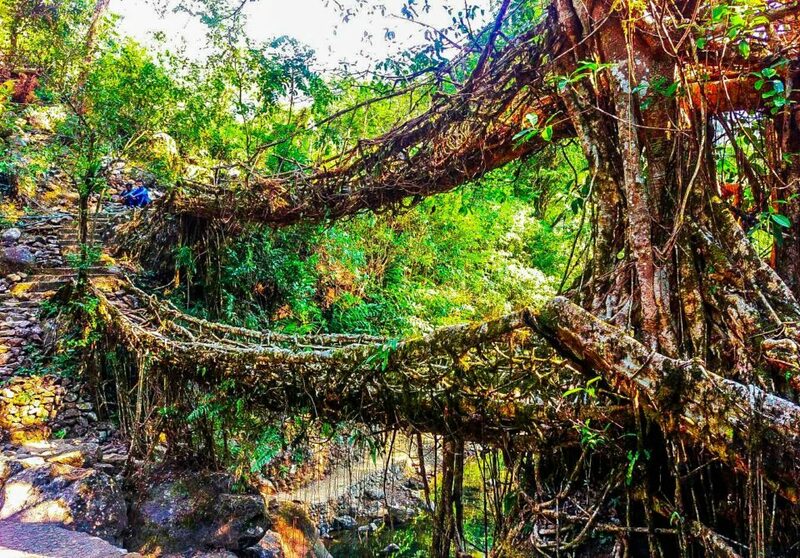 The root bridges of Meghalaya grow naturally by themselves. It takes about 15-20 years for the root of the rubber plant to be able to bear human weight. The Khasi people slice out and hollow out the trunks of the betel nut tree to guide the roots in the right direction for a bridge to grow. This hollowed out betel nut tree trunk helps the roots to grow straight and not grow secondary roots. 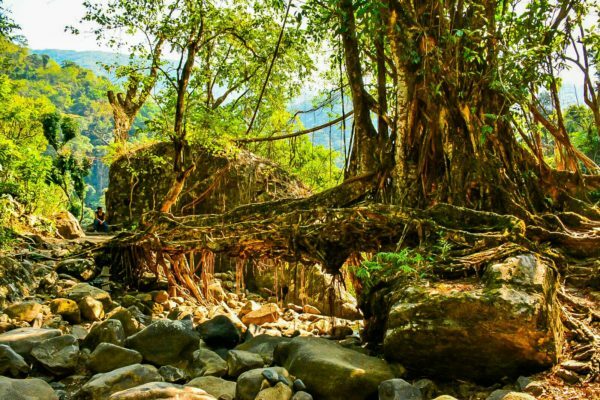 These guided roots reach other of the river or the other side of the mountain depending on where the Khasi people aimed these hollowed out trunks to grow. Once the few straight shoots have reached the other side the Kha people let nature takes its own course. The roots of the rubber plant keeps growing and wrap may more roots around the guided root system. This process of many roots growing along and around the main system keeps continuing for many years and the bridge becomes operational in about 12-15 years. When many such roots bunch up and grow in the same direction in time they become sturdy bridges that can bear many people’s weight at the same time. These bridges are constantly growing, these roots are growing continuously thus repairing themselves of natural degradation. The Umshiang double-decker bridge is a 180 year old bridge that has been in constant use by the Khasi people and visitors. The trek albeit a bit difficult, is not impossible to do. We started our journey at a small village called Tyrna. We trekked 3 kilometers first to the first suspension steel bridge after crossing it we trekked about half a kilometer to the second suspension steel bridge over a gushing river. Once on other side we trekked another half a kilometer to the first single decker root bridge. We took pictures and trekked on to the second bridge. We were not ready for the beautiful double-decker root bridge that greeted us. This bridge stood there majestically beckoning us to walk over and cross to the other side like the Khasi people have been doing for the past 180 years. We walked over the bridge several times. Took many photos and sat near the bridge absorbing the silent beauty of nature around us. After a while some noisy young men forced us to move on but the trek to this beautiful bridge was worth every aching muscle. The trek to the double decker bridge is approximately 4 kms. There are about 3700 stairs to go down and up one way to reach the bridge. The trek is daunting, slippery at some places and the suspended steel rope bridges swing in the wind making it a bit scary for people who like stable ground under their feet. The steps downward are steep and narrow at places. The entrance fee per adult is Rs.10/- and for camera is Rs.20/- there are many small shops along the way so water, tea and light snacks are available enroute. There are pay and use bathrooms too. Do remember to carry water, protein bars, medicines, tissues, soap, light jacket that can double up as rain wear, sunscreen, a light towel and change of underwear if you plan to take a dip in the water pool at the double decker bridge, camera to capture memories and anything else that you may deem important. Make sure you get there early, natural light starts to dim by 3PM and it starts getting cold. Prepare for a day’s worth of trekking. It is very easy to go down but while coming back there are about 3000 stairs to climb up. If you are not in the pink of health, or very young or very old this is not a trip for you, consider going to another root bridge. There are about 11 root bridges around the area. Some of these root bridges are said to be 500 years old. The root bridge in Mawlynnong village is very close and does not require heavy trekking of any sort. It was an exhausting trip for us but we brought back with us some beautiful memories to last our lifetime.